#Japan #Explosion : Multiples injured after #blast rips through #restaurant in #Sapporo. A major explosion occurred at a restaurant in the Hiragishi district of Sapporo’s Toyohira Ward around 8:30 p.m. Sunday. At least 41 people have been reported injured, with one person in critical condition, metro fire department officials said. From the heavily damaged structure, several people were rushed to hospital by ambulance as fire and smoke rose from it. Eyewitnesses reported smelling gas in the area following the explosion. The explosion, which shattered in glass windows in neighboring buildings, reportedly came from a Japanese-style pub named Umisakura. “I heard a ‘bang,’ which sounded like thunder, and my condo was shaken,” said a man who lived nearby. 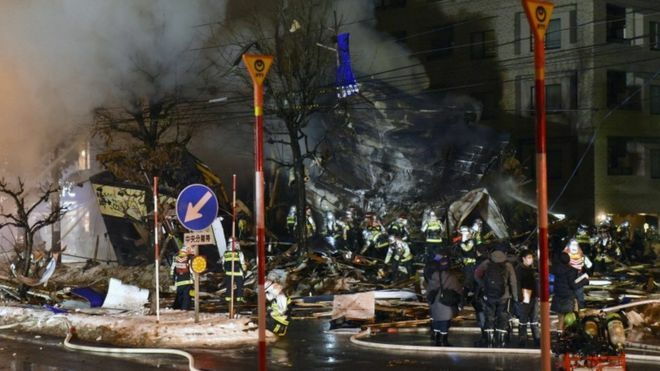 #BREAKING: An explosion at a restaurant in the Hiragishi district of Sapporo, Japan has injured at least 20 people and several are still missing according to Japanese authorities. Reports indicate the explosion was likely caused by a gas leak. There was no immediate word on the cause of the blast, which the agency said had caused a number of buildings to collapse. Police and firefighters worked to get the site in the city's Toyohira ward under control, fighting flames and smoke, and warned people in the neighborhood of the possibility of another explosion, the agency reported.